Even if you are not a beer lover or beer fan, there is some great food that goes along with a Oktoberfest celebration. Of course there are lots of meals involving sausages and wursts of various kinds, but there are also lots of uses for things like pork and cabbage. Williams-Sonoma posted some great recipes a little over a week ago that concentrated on the Oktoberfest meals and what you can make at home and I recently tried out a couple of them. 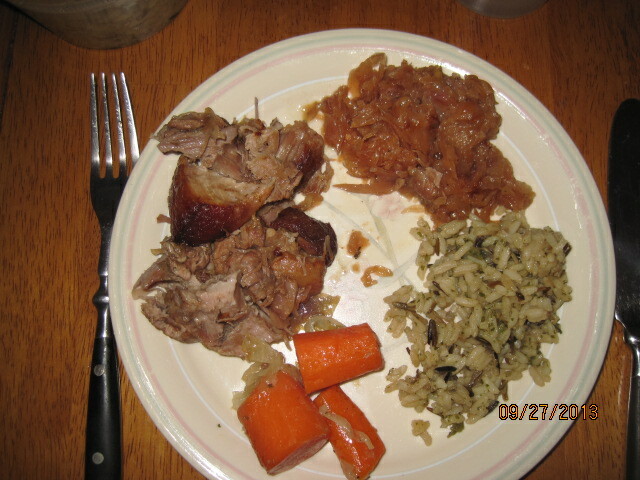 The first one I tried was a nice meal of pork shoulder with sauerkraut and apples. 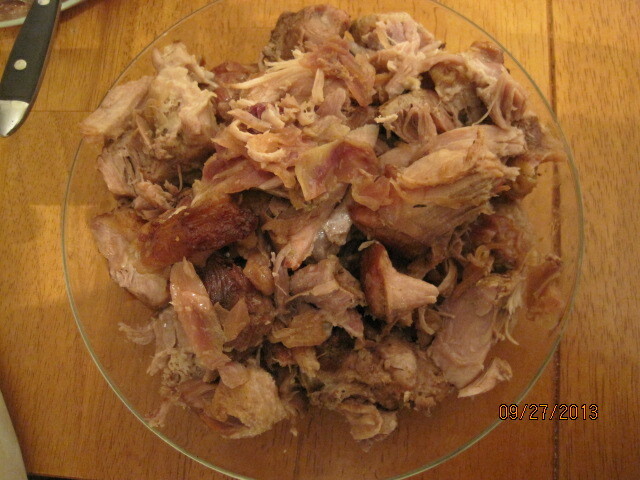 I had picked up a very large pork shoulder on sale, cut it into two roasts, removed the bone and froze half of it. I used the other half for this recipe. Lay the pork flat, boned side up, on a cutting board. Using a sharp knife, trim away any large pockets of fat. Starting at the thinner end of the meat, roll up the pork and securely tie the roll at regular intervals with kitchen twine. Season the pork generously with salt and pepper. In a fry pan over medium-high heat, melt the butter with the vegetable oil. Add the pork and cook, turning frequently, until it is well browned on all sides, about 10 minutes. Transfer the pork to a platter. Return the pan to medium-high heat, add the onion, apples and thyme, and saute until the onion and apples are lightly browned, about 5 minutes. Transfer the apple mixture to a bowl. Pour off the fat from the pan. Return the pan to medium-high heat, add the wine and de-glaze the pan, stirring with a wooden spoon to scrape up any browned bits from the bottom of the pan. Pre-heat the oven to 325 degrees. Cover the bottom of a large Dutch oven with the sauerkraut. Sprinkle the sauerkraut with the brown sugar and caraway seeds, if using. Place the pork on top of the sauerkraut and surround it with the apple mixture. Pour in the wine mixture. Cover, transfer to the heated oven and cook until the pork is fork-tender and shreds easily, about 4 to 5 hours. Transfer the pork to a carving board. Using a sharp knife, cut the pork crosswise into slices about 1/2 inch thick, removing the twine from the pork as you slice. Place the sauerkraut on a large platter and top with the pork slices. Surround the pork with the apples and serve immediately. This dish also lends itself very well to cooking in the slow cooker. All you need to do is cover the bottom of the slow cooker with the sauerkraut and sprinkle the brown sugar on top of it. Place the pork on top of the sauerkraut and surround it with the apple mixture. Pour in the wine mixture, cover, and cook on low until the pork is fork-tender, about 8 to 10 hours. I did change a couple of things about this recipe. I did not use the caraway seeds myself. I also substituted chicken broth for the white wine. You could just as easily use water instead of wine or broth if you like. Finally, I only used 1 pound of sauerkraut and then substituted some shredded red cabbage for the rest of it to give things a bit of a different look and flavor. The 5 hour cooking time gives the cabbage and the pork incredible flavor. The meat falls and shreds much like pulled pork would but you get a nice bite of the vinegar in the sauerkraut and the taste of the apples. I think it’s a great dish. I served this with some wild rice and applesauce. That’s all I have for today. Check back tomorrow for another Oktoberfest recipe I just tried for pork chops with a cider glaze. It was also a great recipe to try out this time of year. Until next time, enjoy the rest of your day and enjoy your meal! 31 Awesome Dips for Football Noshing – Bon Appétit. If you are going to have chips while you watch the game, or are having a party or just one a great snack, then you need to make sure you have a good dip on hand. Sure, you can buy stuff from the store and go with that, by what not get much better flavor and control the content yourself and put some time in to make your own. Most of these dips from Bon Appetit are really easy to make and you can find yourself making your own dip all the time with little effort. Check it out! You would think we would get tired of eating chicken since we have it so much. I think that is one of the reasons I am always looking for some way to do it just a little differently. 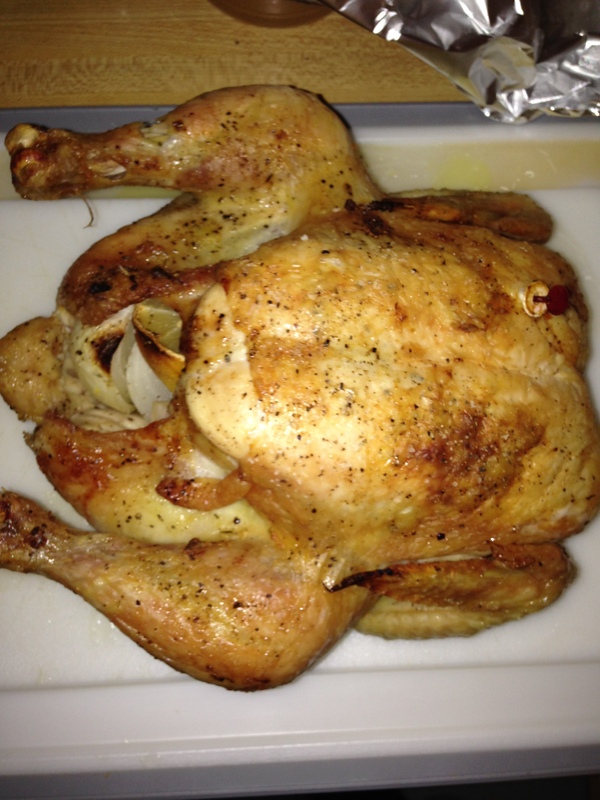 Buying a whole chicken and roasting it is a great way to get several meals out of one dish. We usually have leftovers where we can use the chicken for another dinner, like a chicken salad or chicken tacos or something of that nature, chicken sandwiches for lunches and then I use the carcass to make chicken stock which we use for soups. A $6.00 chicken then turns into 4 or 5 meals, making it really worth the effort. You can also cut up the chicken yourself instead of paying extra for a package of parts in the store. It’s a little extra time and effort on your part, but it’s worth it. I made this simple roasted chicken recipe that I found from Kelsey Nixon of the Cooking Channel the other night and it came out great. Preheat the oven to 450 degrees. Rinse the chicken and pat it dry. in a small bowl, make a compound butter by combining the softened butter, minced thyme, garlic cloves, lemon zest, salt and pepper. Season the cavity of the chicken generously with salt and pepper. Stuff the cavity with the lemon quarters, a handful of fresh thyme and the quartered onion. Place the carrot, celery and chopped onion in the bottom of the roasting pan and place the chicken on top of the vegetables. Cross the legs and tir them with kitchen twine. Gently lift the skin away from the chicken and spread 2 tablespoons of the compound butter mixture underneath the skin, distributing it evenly. Spread the remaining compound butter over the entire surface of the chicken and then season the chicken generously with salt and pepper. Place the chicken in the oven and roast for 20 minutes. Reduce the oven temperature to 375 degrees and roast the chicken until a meat thermometer inserted into the thickest part of the inner thigh not touching the bone registers 160 to 165 degrees, about 45 minutes. Transfer the chicken to a cutting board to rest for about 15 minutes. Remove the vegetables from the bottom of the roasting pan and set aside. Tent the chicken with aluminum foil to keep it warm. Pour the pan juices into a large glass measuring cup. Spoon the fat off the top of the juices. Add the chicken broth to the roasting pan and place the pan over high heat. Bring the broth to a boil, scraping up any browned bits on the bottom of the pan.Return the pan juices to the pan and whisk the flour into the broth mixture and bring to a boil until slightly thickened, about 2 minutes. Season the sauce to taste with salt and pepper. Serve alongside the roasted chicken. The vegetables on the bottom of the pan serve like a roasting rack and lift the chicken up so it roasts better on the bottom. The vegetables also get the benefit of a lot of those juices, so I chose to peel the carrots first and then we had the vegetables as a side dish with the chicken, along with some green beans and wild rice. I used my trusty cast iron pan to do all this to make clean up easier and making the pan sauce easier when the chicken was done. The chicken fit perfectly in there anyway, so it worked out well. The flavor the compound butter provides the chicken was great and we got some nice crispy skin to boot. The chicken was very moist and done perfectly and will work well for other meals. it was also very easy to do and everything thing was done in not much over an hour, so it was great for a weeknight meal. That’s all I have for today. Check back next time for some more recipes. I made a nice slow roasted pork last night that has a great recipe to it that is perfect for a Oktoberfest kind of meal, so check back for that. until next time, enjoy the rest of your day and enjoy your meal! I probably don’t make good enough use of our slow cooker. I always say I am going to use it more but somehow it just seems to slip my mind. The problem I have is that our kitchen is small so it is not a piece of equipment I can keep on the counter and remember to use often. It is usually when I see a recipe I like that makes use of the slow cooker that it jogs my memory. That is exactly what happened with this soup recipe that I found from A Year of Slow Cooking. This recipes uses 3 different kinds of beans, which I love, and some interesting spices to create this one pot meal. Add the chopped onion, celery and carrot to the slow cooker and sprinkle over the bottom. Drain and rinse off the lentils, garbanzo beans and pinto beans and add them on top of the vegetables. Grate the ginger on top of the beans and then add in the garam masala, cayenne pepper, cumin, nutmeg and cinnamon. Stir in the broth or water and the diced tomatoes plus the juice. Stir the mixture to blend everything together. 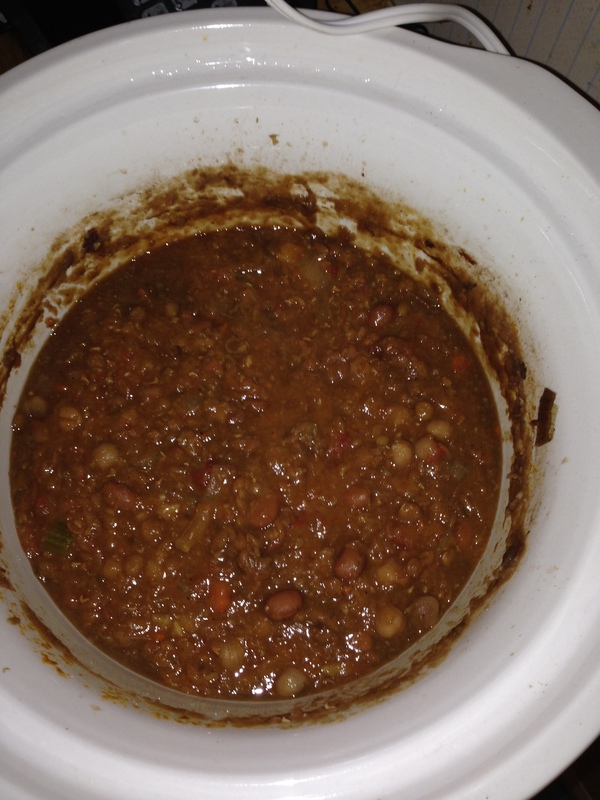 Cover the slow cooker and cook the soup on low for 8 to 10 hours. Before serving the soup, use an immersible blender to pulse and blend some of the vegetables and beans together. This will help to give the soup a better texture and meld some of the flavors together. This recipe makes a good bit of soup, so you will have leftovers for lunches or another dinner, or you could even freeze some to use as an emergency dinner for another weeknight when you don’t feel much like cooking. Garam masala is a spice blend commonly used in Northern Indian cooking that mixes together pepper, cumin, cloves, cinnamon and cardamom. It really adds some nice flavor and fragrance to this dish. All of the spices work well together and give great taste to this soup and using the immersible blender really helps to give it a velvety smooth texture to finish off with. If you use vegetable stock or water in this dish, you can make it vegetarian. 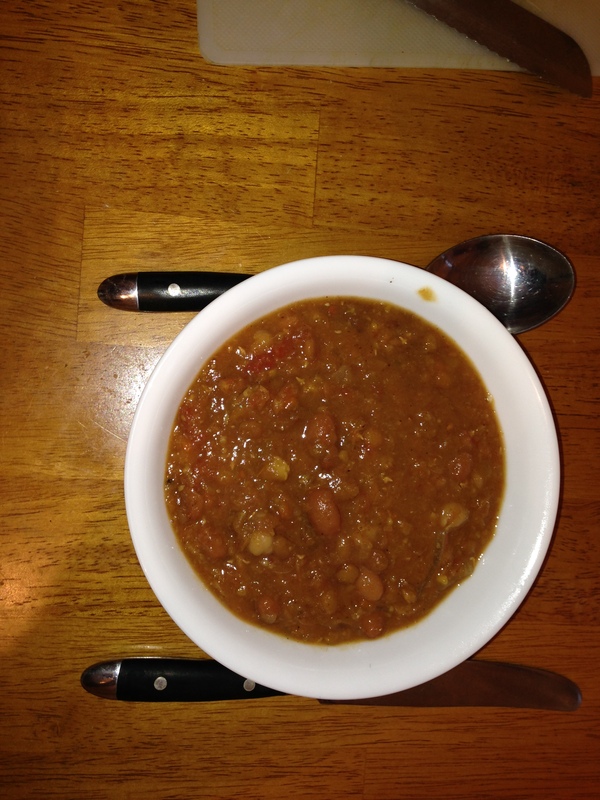 You get plenty of protein from all of the beans in the dish and I have had some for lunch after the dinner we had of this soup and the flavor does seem to get even better. If you want to save yourself even more time with the slow cooker, chop your vegetables the night before, get everything prepped on your counter, and then you can just throw it together in the morning before you run out the door to start your day. That’s all I have for today. Check back next time for another recipe. I still have lots I have been working on, including a new roasted chicken dish I tried last night. I also have some other great recipes from the Cooking Channel, Food Network, Food Republic, Cook’s Country and Williams-Sonoma that I will be trying over the next few days and weeks, so check back for those. Until next time, enjoy the rest of your day and enjoy your meal! I love sandwiches. There are few things better than having a good sandwich for lunch or even dinner. Bon Appetit has put together 41 recipes for several different kinds of sandwiches that will appeal to everyone and give you some great ideas of new things to try for lunch or dinner. Check it out! The weather has started to get a little more Fall-like around here the last few days so I had planned to make a couple of soups this week to fit the occasion. Soups make a great dinner because they are filling, delicious and nutritious all in one. I had bought a butternut squash at our friend’s farmstand this past weekend and then I found this great recipe from Michael Chiarello for a different butternut squash soup recipe than I had made before. It makes use of some different spices to give a different flavor and roasting the squash with some of these ingredients really added something to the meal. For the spice rub: Toast the fennel seeds, coriander seeds and peppercorns in a small, heavy pan over medium heat. When the fennel turns light brown, turn on the exhaust fan above your stove, add the red pepper flakes and toss the mixture vigorously. Immediately turn the mixture out into a bowl to cool. When the mixture has cooled, place it in a blender or spice mill with the chili powder, salt and cinnamon and blend until all the spices are evenly ground. Keep the spice mix in a glass jar in a cool, dry place. For the squash: Preheat the oven to 400 degrees. Peel the squash with a vegetable peeler, halve lengthwise and discard any of the seeds. Cut the squash into 1-inch diced pieces. Place the squash in a large bowl and season with salt and pepper. Heat the butter in a medium skillet over medium-high heat. When the butter stops foaming and has turned a light brown, pull the pan off the heat and add the sage, sugar, vinegar (keep your face back when you add the vinegar), molasses and the toasted spice rub. Mix well and allow it to simmer over medium-low heat for 1 to 2 minutes to meld the flavors. Pour the vinegar mixture over the squash and toss well. Transfer the squash to a heavy, rimmed baking sheet or baking dish large enough to hold the squash in a single layer. Place the squash in the oven and roast, tossing at least once, until it is very tender and caramelized, about 45 minutes to 1 hour. Set the squash aside until it is cool enough to handle but still warm, so the liquids are still runny. Working in batches, if necessary, transfer the warm squash and all the cooking liquids to a food processor and process until the mixture is smooth. You can use the squash immediately or refrigerate it for up to 5 days or freeze it for up to 2 months. For the soup: Heat the olive oil in a large saucepan over medium heat until hot. Add the onion, celery, carrot and cinnamon stick and saute until the vegetables are soft but not brown, about 10 minutes. Season with salt and pepper. Add the chicken or vegetable stock and bring the mixture to a boil. Simmer for several minutes. Stir in the squash until it is smooth, then simmer gently, allowing the flavors to meld, about 10 minutes. Discard the cinnamon stick. Puree the soup in a blender, in batches if necessary, until it is smooth. Return the soup to the pan and re-heat it gently. Add the half-and-half and adjust the seasoning with salt and pepper to taste. Keep warm until you are ready to serve. A couple of things about this recipe. The toasted spice rub makes quite a bit of spice mix. If you think you will use it again later on, it’s great to have on hand. I cut the recipe in half and still had plenty leftover so you can do that if you don’t want a lot of spice mix. You can use the squash puree for other things as well if you didn’t want to make soup with it. I think it would be a great side dish for chicken or turkey just as it is. You could also use other winter squash if you prefer, like acorn squash, and I think it would do just as well. The soup itself has a very roasted, toasty flavor to it. You can certainly taste the spices coming through in the soup but they do not over power the dish at all. I loved the creaminess of the squash and found it to be a very hearty meal. If you use vegetable stock or water instead of the chicken stock, you can make this a vegetarian meal. That’s all I have for today. Check back next time for another soup recipe I just tried. This one was made in the slow cooker and can also be a vegetarian dish, so check back for that one tomorrow. Until next time, enjoy the rest of your day and enjoy your meal! There are fewer snacks that are better for watching football games than Buffalo wings. Sure having chips and dip are great, but when you bring out the wings then you know it is football time. it’s so easy for most of us just to order wings from somewhere and pick them up or have them delivered or just buy the frozen packages of buffalo wings already. The problem is a lot of times the wings you order are overcooked and swimming in sauce and the frozen wings just don’t give you the crunch and flavor. Why not put in a few minutes of your time and make your own wings? This basic wing recipe is from Food Republic and doesn’t get much easier than this one. Line a baking sheet with aluminum foil and lightly spray the sheet with non-stick cooking spray. Mix the flour, cayenne pepper and garlic powder in a medium bowl.Dip each wing piece into the mixture and coat completely. Place the wings on the baking sheet and repeat the process until all of the wings are coated. Cover the baking sheet with the wings in plastic wrap and place it in the refrigerator for at least 1 hour. Preheat the oven to 400 degrees. In a small bowl, whisk the melted butter and the hot sauce until blended. Dip the wings into the hot sauce mixture to coat the wings and place the wings back on the baking sheet. Bake the wings for 45 to 55 minutes, turning the wings once after 20 minutes of baking so that each side gets crispy. Remove from the oven and serve with bleu cheese dressing, ranch dressing, extra hot sauce and cut-up vegetables like celery and carrots. Of course, you don’t have to coat all the wings in hot sauce if you prefer something else. You can always make a quick mix of your favorite barbecue sauce and some honey or just barbecue sauce, maybe some teriyaki sauce or just have them plain if that’s what you like. Personally I like the Buffalo wings and I really liked this recipe. 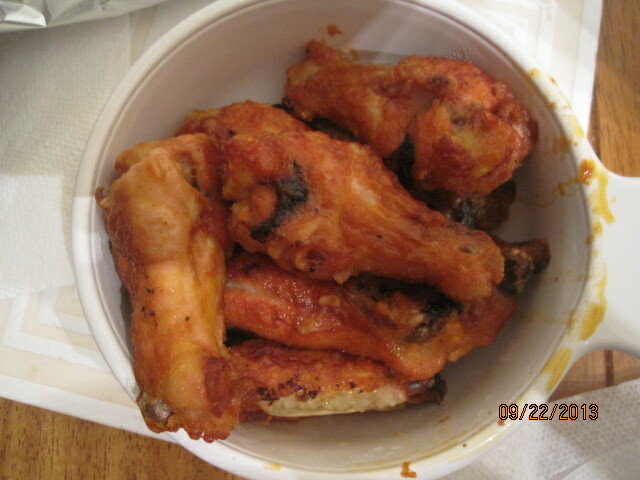 The flour helped to give the wings a nice crunch when they were baked. Placing them in the refrigerator for an hour or so also helps them to dry out some and get rid of some of the moisture that can make them soggy. This is also a much better alternative to deep-frying, which is not the best for you where health is concerned with all that oil and it leaves quite a mess to clean up. I think this recipe is a great alternative and makes some great wings. That’s all I have for today. Check back next time for another recipe. 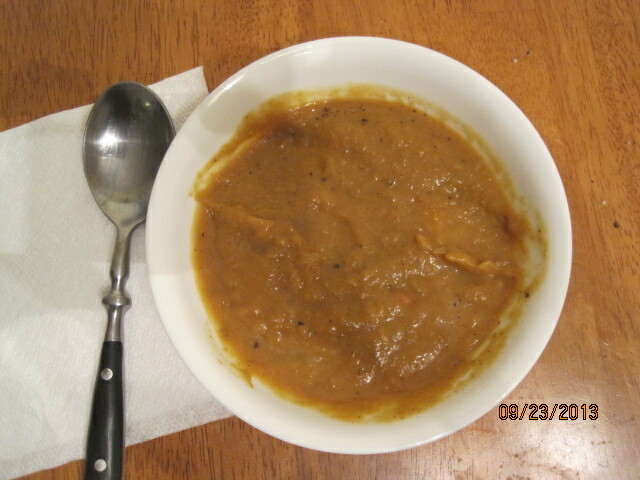 I have tried some soups this week, so I’ll be posting recipes for those as the week goes on. Check back and see what comes up next. Until next time, enjoy the rest of your day and enjoy your meal!